LIPPY is a range of long-wearing, lacquer-like lip glosses in shades to match our famous nail lacquers. Like the butter LONDON nail lacquers, LIPPY colours are rich and heavily pigmented for a look that is deliberate, high fashion, and luxe. LIPPY does not contain parabens, phthalates, sulphates, or bismuth. If you’re being LIPPY, look the part. The LIPPY ($17) Lip glosses come in matching shades as the nail polishes so you can match your lips and tips. They come in a range of wearable shades that makes it easy to match them to your nails. The texture of these glosses are a little thick, they go on very pigmented and smooth. Snog is a hot pink with no shimmer/glitter. The LIPPY and the nail polish are very wearable and complement most skin tones really well. Trout Pout is a bright, coral pink, a perfect shade for summer. The LIPPY isin't the most flattering shade on me but, the nail polish is something I've worn a lot on my toes this summer! The gloss pairs very well with a darker, smokey eye since it is quite pale on its own. As for the staying power, these glosses last about 3 hours on me and feel quite moisturing, more like a liquid lipstick. They do however have a very strong fragrance that I'm not very fond of. I wish they had toned down the fragrance a little since the formula wears comfortably. If you don't like fragrance in your lip products, you might be put off by the very strong fragrance of LIPPY. Overall, although I love the smooth texture and the pigmentation of this gloss, I would recommend you take a sniff before buying it. If you don't have a problem with a lot of fragrance in your lip products, LIPPY is worth indulging in! 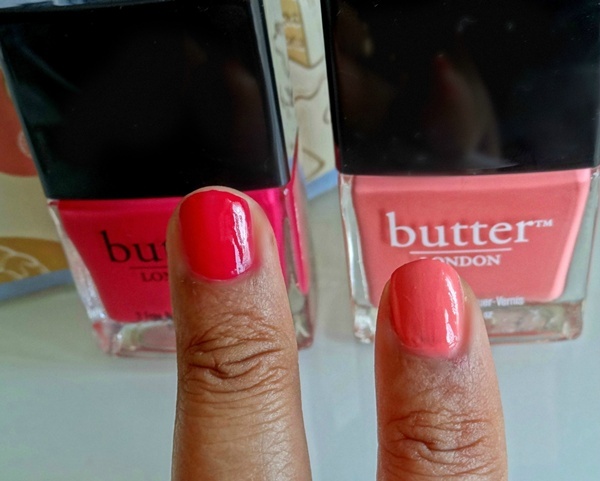 Have you tried butter LONDON's LIPPY? Aren't they lovely? Snog is such a great hot pink! Trout pout is my favorite from their newly released shades :) looks very pretty.